GHOSTS: AN HISTORICAL JOURNEY PART 2 THE HEADLESS HORSEMAN Washington Irving was born on April 3, 1783 in New York City and was the youngest of 11 children born to William and Sarah Irving. The Revolutionary War had ended and as a tribute, his parents named him after military hero and future President George Washington and as a six-year-old he attended Washington inauguration in 1789. Mostly self-taught, he began his eventual career writing essays under the nom de plume Jonathan Oldstyle for the Morning Chronicle, the editor of which was his brother, Peter. Irving had decided to become a lawyer and while not a great student, he nonetheless passed his bar exam in 1806. It was as a writer, however, that he displayed a true talent. Some early works were critically well-received but with a stalled career, he entered the military (at one point being stationed here in Rhode Island at Fort Adams) and fought in the War of 1812. In 1815, he traveled to England to assist in a family business and while there wrote a collection of short stories and essays called, The Sketch Book of Geoffrey Crayon, Gent. The book contained what would go on to become two literary masterpieces, Rip Van Winkle and The Legend of Sleepy Hollow. Oddly enough, it was a contagion that brought Irving to Tarrytown, NY as a teenager. Yellow fever epidemic has struck New York and the environmental conditions upstate would prove much safer and healthier. He makes veiled reference to this in the story by calling Sleepy Hollow a place with “contagion in the very air… it breathed forth an atmosphere of dreams and fancies infecting all the land.” He was invited to stay with his friend, James Kirke Paulding and was immediately taken by the tranquility of his new surroundings, a stark contrast to the chaotic lifestyle in New York. He found himself attracted to something else less tangible there: the ghost stories told by the locals. He heard one in particular of a headless Hessian who was buried near the Old Dutch Church who would ride his spectral steed to the scenes of conflict to locate his missing head. The story is actually a combination of two earlier folktales, one Irish and the other German. In the Irish version, the horseman is actually a horse racer and not evil at all. This is alluded to in the story when Abraham “Brom Bones” races Ichabod for a bowl of punch. In the German version, an old man who does not believe in ghosts is taken on the horse as he returns from the hollow and together ride roughshod over the landscape until they reach a bridge where the horseman morphs into a skeleton, throws the old man in the river and rides away over the treetops to a roar of thunder. The idea of the headless horseman has its roots back in Arthurian times, but Irving took it to greater heights than ever before and many have deemed it, “America’s first ghost”. In it, a mild-mannered, superstitious Connecticut schoolteacher named Ichabod Crane settles in Tarry Town (now officially called Sleepy Hollow) at the end of the 18th century. His angular frame, awkward appearance and his bookish manner make him one of the first literary heroes in a very non-classical way. He immediately is smitten by young Katrina Van Tassel but there is an obstacle in the form of virile and rebellious Abraham Van Brunt. As Crane leaves the Van Tassel house after a party one night, he is suddenly chased by the hideous spirit called the Headless Horseman, supposed to be the ghost of a Hessian soldier who had his head shot off by a cannonball during the Revolutionary War. In the Horseman’s mind, the battle has never ended. His identity has always been a catalyst for literary speculation. Was he an actual spirit? A man (perhaps Abraham) in disguise? Or the Devil incarnate? Crane rides away trying to escape with the Horseman in hot pursuit, and all that remains of him the following day are his hat and a shattered pumpkin. Interestingly, perhaps because of the symbolism, this tale has become a Halloween staple, yet Irving never mentions the holiday, in large part because Halloween did not exist in any “official” form at the time the tale was written. Another less-discussed aspect of the story is that in some ways Crane is not as likable as most primary characters are and there are many who prefer to root for the ghost, an storyline that has found its way into many forms of media since then. Today the actual town of Sleepy Hollow, NY holds the same grip on people’s imaginations and is said to be in fact, quite haunted. THE DOPPLEGANGER Mary Shelley will forever be immortalized for her master work, “Frankenstein”. But on July 8, 1822 her husband and a prolific and accomplished poet in his own right, Percy Byssche Shelley met his own fate when his ship the Don Juan went down in a storm off the Gulf of Spezia. Tragic enough, yes, but the story of Percy Shelley goes much deeper and it involves a bizarre and legendary entity called the doppleganger. The doppleganger translates from German to “double- goer”. It is a look alike or a double of a living breathing person. Legend has it that if one sees their doppleganger, it is a harbinger of disaster. In his drama, Prometheus Unbound, Shelley describes the doppelgänger as a counterpart to the self. As it turns out, he seemed to know that of which he wrote. Percy and Mary had rented a house in Lerici in April of 1822. Joining them was Mary’s stepsister Claire and friends Edward and Jane Williams. The house was situated right on the ocean. Shelley was inspired by the setting and started creating a new poem called The Triumph of Life. Before they arrived at Lerici, tragedy had already struck their party. Clair’s 5-year-old daughter had died of fever at an Italian convent. Her father, Lord Byron, had taken her there. Clair was devastated and still trying to work through her grief. As for Percy Shelley, he was going through a form of trauma himself. One night while standing on the terrace with Edward Williams, he abruptly pointed to the sea and shouted, “There it is again! There!” Although Williams saw nothing, Shelley described it as a small naked child staring at him, smiling. At this time Shelley was having horrible nightmares and these sort of visions while he was fully awake were becoming more frequent. This was also a time when the Shelley’s marriage was going through some upheaval. Mary was pregnant again, having already lost three children and she was quite agitated at the prospect of losing yet another. Her time at the house was not a happy one and she was prone to dramatic mood swings. She also had a eerie feeling that something dreadful was about to happen. In June, Mary’s worst fears were realized when she suffered yet another miscarriage. With no doctor for miles, she was in real danger of bleeding out. But her husband sat her in a tub of ice to stop the bleeding until it eventually subsided and help could arrive. A few days later, Shelley claimed to have seen his doppleganger out on the terrace. As they stood face to face, his double asked, “How long do you mean to be content?” and it was only a week after Mary’s miscarriage that the entire house was awoken in the middle of the night by Percy’s screams emanating from his bedroom. He was prattling incoherently about an apparition he had seen of his friend Edward Williams covered in blood as the ocean flooded the house. This apparition suddenly morphed into another vision, that of himself strangling his wife while she lay in bed. Was this figure Shelley had seen standing over his wife the doppleganger who approached him on the terrace? And what was the meaning of his cryptic inquiry? It was learned that Shelley had at some point made an attempt to purchase prussic acid and there is speculation that he did so with the intention of taking his own life with a lethal dose. It is not truly known if this was his plan, but fate managed to intervene nonetheless. One morning, Jane Williams watched as Percy Shelley walked past her bedroom window. A few seconds later he walked past again in the same posture following the same steps as if she was viewing a recording of him. She was puzzled by this, but what she did not know at that was even more disturbing. Shelley apparently was some distance away on a solitary walk away from the house making plans to sail his Don Juan toward his eventual doom. He set sail with Edward Williams down the coast to the town of Livorno. A week later, the men began their journey back to Lerici, this time accompanied by an 18-year-old deck hand named Charles Vivian. There were some warnings that bad weather was approaching, but Shelley insisted on setting sail nonetheless. As nature waits for no one, several hours later the ship was engaged with a terrible storm. Another boat, seeing their ship struggling mightily in high winds and heavy seas, pulled up to the side of the Don Juan and offered assistance to them by taking them aboard theirs. Shelly refused. The boat captain advised them they must take in their sails or risk certain death and Williams made a move to do so. Shelley grabbed his friend’s arm and sternly exclaimed, “No!” Ten days later their bodies were found washed up on a beach near Viareggio and in complying with Italian quarantine regulations, we buried there in the dunes. Shelley’s body could only be identified by the clothes he wore and the book of poems by Yeats in his pocket. His face and hands had been eaten away by predators. Eventually his body was exhumed and burned on a pyre at the beach in a pagan-style ritual. His heart however would not burn and was eventually handed to his wife Mary who kept it wrapped in silk and safely preserved it in wine inside her writing desk for the rest of her days. THE GRAY LADY Captain Frederick Marryat was a British Royal Navy officer and a friend of novelist Charles Dickens whose work with the supernatural will be discussed shortly. Marryat was a novelist in his own right, mainly recounting semi- autobiographical tales of his own life at sea. Not only was he a widely-respected and heroic warship captain but he was also an innovator of maritime equipment and devices such as the lifeboat and a now commonly used system of flag signaling which is famously known as the Marryat's Code. As a novelist, he was among the very first to write about subjects related to maritime activity. Some of his fictional work touched on elements of the paranormal such as The Phantom Ship, which included the ghost ship The Flying Dutchman as a plot device and contained another short story called The White Wolf of the Hartz Mountains, the first of its kind to center on the existence of a female werewolf. While on a hunting party in Raynham, Captain Marryat was to get a closer look at the paranormal not as a writer of historical fiction, but in a real and physical sense. During a Christmas gala in 1835, held by Lord Charles Townshend, what would become an iconic ghost would make its first appearance at Raynham Hall. It was after a game of chess that the men in the party decided to turn in for the night. Heading to their rooms, they all witnessed the silhouette of a woman in a brown dress standing in one of the doorways. Without a word and no warning, she vanished into thin air. The next night a man known only as Colonel Loftus once again saw the same woman, but decided to pay closer attention to her appearance this time. He described her as having a certain aristocratic manner and a peaceful behavior but was horrified to notice the woman had no eyes, what he portrayed as a “dark in the glowing face”. As the story of the apparition spread, it came to pass that Captain Marryat arrived in Raynham for the hunting excursion. Not a man easily frightened by ghost stories and a bit of a skeptic in such things actually existing beyond fictional stories, he was very curious to experience this phenomena for himself if at all possible. The year was 1836. He posited that this was most likely a trick, perhaps cultivated by smugglers to keep people away. He asked to be placed in a room where a painting of the woman Col. Loftus claimed he had seen had been hanging. Perhaps believing the perpetrator was indeed among the living and not anyone back from the dead, Captain Marryat slept with a pistol under his pillow in the event whoever this was made an unwelcome entrance. Two nights passed and nothing out of the ordinary happened. Marryat started to become convinced the whole thing was as he thought, a plan to scare people away, a hoax, or perhaps just the overactive imaginations of prior guests. As he was readying for bed the third night, he answered a knock on his door. Two men were there to ask Marryat’s opinion on a new gun that had arrived from London and wanted to show him the weapon. After the gun had been thoroughly inspected, they all decided to go back to Marryat’s room to await the arrival of the ghost together, jokingly suggesting that he take the pistol to defend himself should she make an appearance. As they made their way through a darkened corridor to the room they were astonished to see a rather somber-looking woman coming toward them carrying an oil lamp. Their first reaction was that it was one of the women in their party so the still half dressed Marryat ducked into one of the bedroom doorways. His companions did the same. As the woman came closer, Marryat suddenly recognized her as the woman in the painting in his room. He then gripped the trigger of the pistol a bit tighter and moved to confront her, but the ghostly woman stopped abruptly in front of them, turned toward them and in his words, “grinned in a malicious and diabolical manner”. Marryat fired a shot toward the woman who simply vanished. The bullet lodged in the door across from them and thus ended their brief but eventful encounter with “The Brown Lady of Raynham”. Over the next century, stories of Brown Lady sightings in Raynham Hall continued but it was not until 1936 that anyone could provide any documentation of her presence. On September 19th, a photographer from Country Life magazine named Captain Hubert Provand arrived with an assistant, Indre Shira to take pictures of the house for an article being done. The photographed the staircase when Indre drew attention to something mist-like coming down the stairs toward them and they both watched as the mist began to solidify into something that resembles a female. Shira ordered Provand to aim the camera at the stairs and when he complied, Shira hit the flash trigger. What they saw upon developing it astounded them and became one of the most iconic and scrutinized ghost photos ever taken. The form appeared in the December 26, 1936 issue and it was ran again in the January 4th, 1937 issue. (Country Life magazine still has possession of the negative from that day.) As mentioned, the photo has been analyzed throughout the decades that followed up until the present day. There are those like famed paranormal investigator Harry Price who were convinced the picture was genuine and those that claim double exposure, debris on the camera lens or a living person coming down the stairs that appears as a blurred figure due to the very long shutter speeds and even longer development process of camera of that time. One interesting claim is that is the image of the Virgin Mary superimposed on the stairs. Whatever the case, the photo will remain at least for this time as one of the most talked about and pointed to examples of photographic paranormal documentation. Who is the Brown Lady? It is thought by some it is the wandering spirit of Lady Dorothy Townsend (left), second wife of Lord Townsend. She fell in love with Charles Townsend and he asked her father for her hand in marriage. Her father refused. Charles then married a woman named Elizabeth Pelham, but she died leaving Charles widowed with five children. He and Dorothy eventually reunited and all seemed well until Charles found out that during their time apart she had an affair with the father of one of the founders of the Hell-Fire Club. In a rage, he locked Dorothy in a room and forbade her from seeing the children. She remained there until smallpox ended her life in 1726. THE SPIRIT OF CHRISTMAS Charles Dickens was born in Portsmouth, England in February of 1812 he was born into a very poor family and had to go to work in a factory at the age of 12 when his father was jailed for an inability to pay off debt. Young Charles learned quire early in life what it was like to toil in harsh conditions under ruthless management and this life experience would help with the background for one of the most iconic ghost stories in all of history, A Christmas Carol. With no formal education, he went on to write 15 novels and hundreds of short stories. He was also in high demand as a lecturer and, to no surprise given his upbringing, a staunch advocate of children’s rights and social reform. Other classic works from the mind of Dickens were Oliver Twist and Great Expectations which follow a theme of many of his novels in painting an often grim picture of life in Victorian London. A Tale of Two Cities, written in 1859, was set in both London and Paris but still used a social narrative in its plot. David Copperfield was one of his personal favorites and it dealt with class struggle, a subject Dickens was very much attuned with. Of all his works, Copperfield is considered as closest to an autobiography. Dickens was a great admirer of Washington Irving and was inspired by a Christmas story in Irving’s The Sketch Book. “I do not go to bed two nights out of seven without taking Washington Irving under my arm upstairs to bed with me” he once said. In 1843, Dickens began his story relying on equal parts study into the spirit of mankind and the supernatural and a mere six weeks later one of the most revered pieces of historical fiction was completed. The story centers around a miserly business owner named Ebenezer Scrooge, who only after the pleadings of an employee, Bob Cratchit, alows him to go home to spend Christmas Eve with his family. By this time he has already refused an invitation from his nephew Fred to join them for Christmas at Fred’s home. 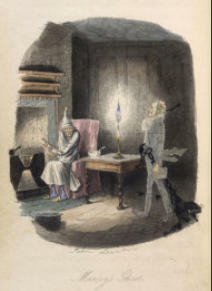 Now alone and in his misery, Scrooge is visited by four ghosts on Christmas Eve. First, it is the spirit of his deceased business partner Jacob Marley who is encumbered with chains, padlocks, keys, ledgers and money boxes he must carry through all eternity symbolizing the moral constraints of greed and hubris. Like many ghost stories yet to be written and told, the ghost is also described as transparent, so that Scrooge could see the buttons on the back of his coat right through him. He tells Scrooge that he will be visited by three other ghosts and must pay heed to them lest he suffer the same fate as Marley. The first is the Ghost of Christmas Past who spirits Scrooge away to the more innocent time of his boyhood. Scrooge sees himself as a very lonely and isolated child whose closest friend was his sister, Fan. He then is taken back to a Christmas party that was hosted by his very first employer, Mr. Fizziwig with whom he had a very close relationship. His transformation into a greedy, insensitive man is revisited with a vision of his ex-fiancée Belle - who ended the relationship when she came to the realization she could never be more important to him than money - who is now married and happily celebrating Christmas Eve with her close and loving family seven years earlier on the very night Marley died. Scrooge is shown how the path he chose in his formative years robbed him of his own ultimate happiness. The Ghost of Christmas Present now travels forth with Scrooge to present day England and they bear witness to people walking about town, gathering all the ingredients for their Christmas dinner, bidding each other glad tidings. They also visit nephew Fred’s house where all are gathered joyously sharing the holiday as a family. Fred expresses some concern for his uncle, but they eventually mock Scrooge and quickly turn their attentions back to the moment and their own happiness. Lastly, they visit the home of Bob Cratchit, who has a young son they call Tiny Tim an otherwise very cheerful boy, even though he is burdened by a serious illness. The ghost tells Scrooge the boy will eventually die unless something positive dramatically changes his fate. Scrooge expresses empathy for the child’s plight, but is rebuked by the ghost for displaying his concern. Finally he is visited by the Ghost of Christmas Yet To Come who shows Scrooge what Christmas will be like in the near future. He is taken to the funeral of a man who is plainly disliked by even the minuscule amount of people attending. His is shown no respect and some of his possessions are stolen and sold to a local fence named Old Joe. Scrooge pleads with the ghost to show him just one person who mourns a passing and he presents a couple who are in debt to Scrooge and now rejoice as his death allows them time to put their affairs in order. Despondent, Scrooge asks to see some sign of compassion for a life lost and the ghost transports him to the home of Bob Cratchit, where the family is grieving over the loss of Tiny Tim. In the end, the ghost shows him the man’s grave, isolated and unkept, bearing the name of Ebenezer Scrooge. Breaking down, Scrooge pleads with the ghost for another chance to redeem himself. Scrooge wakes the following morning a changed man thanks to the intervention of the spirits. He drops in on his nephew Fred and family and sends along a turkey to the Cratchit household. The next day he greets Cratchit enthusiastically and offers him a raise in pay. He goes on to befriend Tiny Tim and to treat all with dignity, generosity and respect. In this story, ghosts are used to turn our eyes back on ourselves, to ponder our own failings as decent and compassionate human beings and how the lives we lead dictate our own legacies. It is yet another Dickensian denunciation of the ruling class, but done so playing into all people’s greatest fear, death itself. A Christmas Carol has gone on to be one of the most adapted and performed stories in all of history on stage, television and the silver screen. THE SPIRITUALISTS In the mid-1800s, a new type of religion rose from what is called, “The Second Great Awakening” a Protestant religious revival that combined elements of basic human emotion and the supernatural. It took root in western and central New York around 1840 and was based on the idea that God and angels could be communicated with. It was in this climate that the writings and ideologies of Swedish philosopher and theologian Emmanuel Swedenborg and German physician Franz Mesmer flourished as each introduced methods in which one could create a bridge to the afterlife. Swedenborg claimed he could communicate with the dead and described what the structure of the afterlife looked like and that the deceased could be used as a conduit to speak with God. Mesmer introduced a technique that later would be known as hypnotism, where an individual could be placed into a trance whereupon they could speak to the deceased. (One of the devices used as a means to communicate with spirits was called “The Talking Board”, which ultimately came to be more commonly known as “The Ouija Board”. For a more detailed article on the board go to The Ouija Board Demystified.) It is commonly believed that the Spiritualist movement began in 1848 in Hydesville, NY with two sisters from the Fox family named Kate, 12 and Margaret, 15. They claimed to have contacted a spirit they named “Mr. Splitfoot” (aka The Devil) and could communicate via a series of knocks. Some time later, Mr. Splitfoot was said to actually be a peddler named Charles Rosna who claimed to have been murdered five years earlier and buried in the basement. As the communication could be achieved in front of others, they soon convinced - or perhaps merely recruited - their divorced and poverty-stricken older sister Leah into the fold and she agreed to manage them. The girls became nothing less than a sensation. 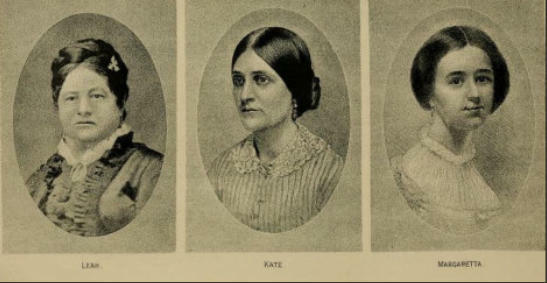 During these heady times, Kate and Margaret relocated to Rochester, NY where Kate lived with her sister Leah and Margaret stayed with their brother David. Despite the relocations, the rappings continued. A Quaker couple who were friends of the family, invited them to use their technique in their own home and became quickly convinced they were the real deal. They spread the word to others in the Quaker community who soon became among the first devotees of spiritualism. Soon, the girls were performing before paying audiences in large venues and attracting the attention of celebrities and dignitaries throughout the world. By 1850, they were demonstrating their abilities in New York City and soon became media darlings, attracting the attention of P.T. Barnum, James Fenimore Cooper and Horace Greeley who provided them a place to stay at his mansion. Soon the girls began performing séances and the audible phenomena soon became visible as well as objects were moved and tables levitated. It would not be long before others began to claim they too had the ability to communicate with the other side and séances became a cultural phenomenon. As is usually the case, the Fox sisters act was also met with extreme skepticism by academics and were put through a never-ending series of tests including their ankles being bound together and their skirts being checked by a committee of women to determine whether there was any slight of hand being used. Despite these examinations, they could not be discredited - as the knocking responses would continue. Grudgingly, these committees had to admit they could find no wrong doing. As with all things successful, things run the risk of getting stale and the stakes grow higher. Leah on more than one occasion was accused of surreptitiously trying to get information for the audience to make her sisters responses more credible. They resorted to trying to summon the spirits of the famous like Benjamin Franklin whose grammar in one session left something to be desired. When one audience member pointed this out, Maggie stormed off saying, “You know I never understood grammar!” In spite of, or perhaps because of this lack of pure artistry, the girls remained wildly popular and profitable. It was in Philadelphia that Maggie met and fell in love with Arctic explorer Elisha Kent Kane whose family, despite her fame, did not think Maggie good enough to marry into their family. Their affair ended tragically in 1857 when Kane died. All but penniless, Maggie had to return to the stage again after leaving the business behind in order to marry Kane. It was then that she began to drink heavily and her overall health and well-being began to deteriorate. Kate too began a slow descent into alcoholism and her performances suffered because of it. While performing for spiritualists in England, she met a lawyer there and married, giving birth to two sons. In 1885, the spiritualist movement began to decline in numbers and interest and Maggie and Kate’s ascension to stardom was suddenly on a tragic decline. Increasingly, calls of fraud were sounded and when Maggie was required to perform a demonstration for an investigative commission in New York, she failed dramatically. Kate had lost her husband to a stroke and by 1888 she had moved back to New York where she was arrested for public drunkenness and what was called “idleness”. Her sons were taken from her by the state. Maggie managed to get them into the custody of a relative in England. In that same year, Maggie decided to come clean and confess that the act was all a sham. She appeared at the New York Academy of Music and claimed it was all done by cracking their toes and that Leah had coerced them into performing as mediums. She also decried spiritualism as nothing more than a sham. Sitting in a balcony above her sister, Kate nodded in agreement. However, later Kate would say she took issue with her sister’s account and continued to perform as a medium. Devoted spiritualists passed off Maggie’s confession as the sad ramblings of a sad, broken and alcoholic woman. By 1891 Maggie would walk back her statement with some surmising it was all done to spite their sister Leah who made a small fortune off her sisters, married well and lived the good life exploiting their talents. By 1892, Kate had drank herself to death at the age of 56 and Maggie passed in 1893 at 59, homeless and destitute. A POE-LARIZING FIGURE One of the most influential people in popularizing the Spiritualist Movement was the famed novelist Edgar Allan Poe. It’s not really known if he truly believed in spiritualism or perhaps was only satirizing it, but his writings had great effect in its growth either way. Beyond literature, Poe had interests in cosmology and cryptography along with the pseudo-science of phrenology, where the shape of a human skull had a direct correlation to their character. Another influence on his writing was “Mesmerism”, introduced by Franz Mesmer who claimed that everyone and everything was united by magnetic forces creating what came to be known as “animal magnetism” and by going into trances, people could tap into their own bodies to better control them or heal them or in some cases, following the lead of Emmanuel Swedenborg, contact the afterlife. The Fox sisters were at their peak of popularity and it was all the rage in Poe’s time, so he naturally introduced elements of it into his writing. One of the best examples is the short story, The Facts in the Case of M. Veldemar where a dying man is put into a hypnotic state at the time of his death so as keep his mind alive after death to see if he could still communicate after his passing. The story was written from a narrator’s point of view and almost told in a news story fashion, so people believed it was an actual account of a procedure. For many years, spiritualists wrote to Poe asking him questions about the final results and of the ultimate demise of the subject until he grew tired of explaining it was all a made-up story. It was even reprinted in a medical journal in England. Such was the influence of spiritualism at that point in time. To illustrate the sway that spiritualism had over a large segment of the populace, we again cite the life of Poe. A young woman from Providence, R.I. named Sarah Helen Whitman became so infatuated with Poe she wrote him letters and poems professing her admiration for he and his works. Being a spiritualist herself, she was enamored with the idea of perhaps becoming involved romantically. She went so far as to write letters to other female acquaintances of his asking more about him. The first time he saw her was on a walk past her house with a friend and declined an opportunity to meet her. When they finally agreed to meet after exchanging poems dedicated to each other, it was only after Poe’s failed suicide attempt via a large dose of laudanum, a powerful opiate. Their “get acquainted” walk was through a local cemetery where he impulsively proposed to her among the headstones. However, she was hesitant to accept because her mother had forbade her to marry him going so far as to threaten to disown her. It was only after a poetry reading in Providence that she impulsively agreed, but with one condition: he had to agree to remain sober which proved to be all but impossible for him. Her mother continued to do her best to interfere with and ultimately terminate their relationship. Even more so after it was discovered he was courting at least two other women at the time. Their wedding plans managed to endure these “indiscretions” and would have taken place on December 25, 1848 had it not been for a letter sent to Whitman from a friend confirming that Poe had broken his vow of sobriety. Staying true to her word, she canceled the wedding. Less than a year later, he was found delirious on the streets of Baltimore and taken to Washington Medical College where he died four days later. Details are sketchy about what happened after his death as far as Sarah is concerned, but it is believed that shortly after his death, Sarah began to hear strange knocking in her room and when she inquired as to whom the creator of the sounds were, she received responses. She came to believe it was Poe trying to communicate with her which would follow along with her spiritualist beliefs. It’s also said she hired a medium to move into her house to assist her with further communication and not long afterwards became a medium herself and continued her quest to reach out to the spirit of Poe.